Fireside Cocoa is a retreat for members of the iOS / Mac (and adjacent!) communities at one of the best ski resorts on the east coast, Killington Vermont. Its goal is to bring together a little over a dozen people for a great weekend of skiing, snowboarding, and camaraderie. Back for its third year, Fireside is happening in 2019 on January 24th - Jan 27th. Join us in a private condo at Killington for a three night trip with two full days of skiing and snowboarding. 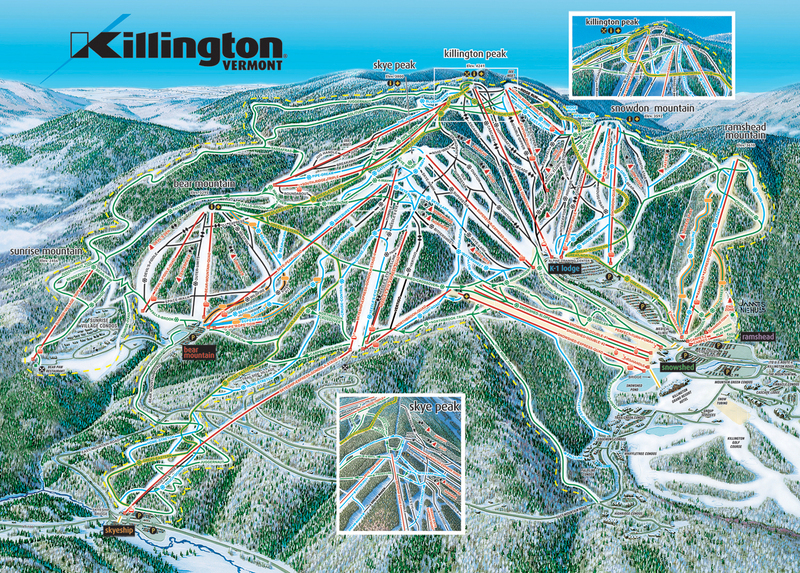 We’ll arrive at Killington late Thursday evening, ski Friday and Saturday, and then leave Sunday morning. While there, you can expect group dinners on Friday and Saturday nights along with group breakfasts. Lunches are self-organized as we'll be at the resort and I have no desire to mother-hen the entire group for a lunch on a 1,509 acres ski resort 🙃. You can plan on two full days of skiing. In past years people liked to stick together in smaller clusters, but we always have enough people of various skill levels that any skill level of skiing or snowboarding is welcome (and they offer lessons there if you're new). It's a great mountain with plenty of trails to check out no matter your experience. Evenings, besides said dinners, are self-organized inside the condo. You're welcome to bring a board game, a Nintendo Switch (SMASH! ), or whatever else. It's generally pretty chill; a great opportunity to chat and make new friends long into the night. Included in the cost is the group house for 3 nights, ground transportation from Philly & NYC to assist those without a car, and the group meals covered. This will cost $375 per person. Lift passes are ~$90 per day when you book ahead of time online. If you need to rent skis or a snowboard you’re looking at an additional ~$50 per day. If you’d like lessons, they are also available through the resort. Killington also has a great Demo Shop if you want to try different high-end skis / boards. You should expect to share a room with someone, but everyone will have their own bed. It is a 9 bedroom place so it is pretty spacious with plenty of room. +1s are encouraged! The atmosphere is one of shared camaraderie, not technical lectures. The last two years were a great mix of people and I’d expect any non-Mac/iOS to enjoy themselves too again this year. The condo has multiple private rooms for couples. The middle of Vermont isn't exactly known for its major airports, so ground transportation will be provided swinging through Philadelphia (in the past pickup as at PHL International Airport around 2pm) and New York City (in the past pickup was at the Hoboken PATH station around 5pm). If you can drive to Killington yourself, there's plenty of on-site parking. Yes, there is wifi. This isn’t a retreat for savages! If you need to get some work done while you’re up here, you’ll be able to. That said, the laptops have rarely come out in the past, most people are too busy chatting to bother with work! Late January is usually very good for Vermont; I’ve been to Killington this time of year multiple times before and had a blast. That said, mother nature never makes any promises, so I can’t make any either. We’ll be in Vermont so expect it to be cold when skiing. You’ll want to plan on bringing multiple layers as it can easily get to be 10 degrees, + chilly winds, especially on the peaks. It isn’t anything extreme, by my definition, but do not underestimate the cold. We will be living together for 3 days, and as such it is important to me that everyone feels safe and welcome. Please refer to the code of conduct for a baseline of expectations. Seriously: make my friends feel uncomfortable and we’ll have consequences and no refunds #phillytoughlove. ‼️ I’m Interested! What Next? Read the code of conduct and make sure you're committed to abiding by it. Shoot me an email, let me know who you are, and if you'll be bringing any +1s. I'll let you know if we still have room, and then I’ll have you Square / Venmo / Apple Pay / Google Pay me the $375 per person. Your beds aren’t reserved until you do this. Fireside Cocoa is organized by Curtis Herbert. You might know him from such events as CocoaLove, WWDC.run, and Philly Cocoaheads.